Tree work continues and so does the brush chipping. 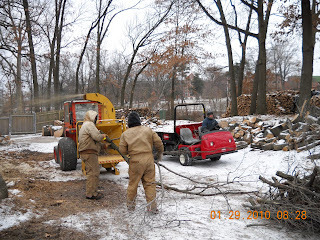 Russ, Jason and Tom grinding up more tree tops and smaller limbs. 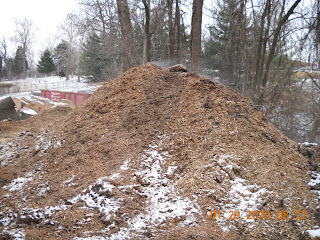 Our pile of chipped mulch has grown considerably this season. This material after some aging will be used in shrub type bed areas. Even in 15 degree temperatures, you can see the steam coming off of the material as the pile begins to heat up from decomposition. Keely and Asst.Mike Walerius's new child Maelyn Margaret Walerius. Look at that head of hair! A $1000 saving on this month's bill and it was extremely cold the last 15-17 days of the period. The unit has paid for itself in the first two months of its use. Do not do post a lot of personal information on this site but could not pass this one up. Congratulations to Asst. Mike and his wife Keely who gave birth to their first child Maelyn(May-Lynn) Margret Walerius at 5:30 a.m. this morning. 7 lbs 15 oz, 21.5" long. I'll post a picture as soon as I get one. Mike's email is mbw6996@yahoo.com if you would like to send them a congratulatory note or send it to the club and we will get it to them. Well, if some of you are like me, we sit in our homes during the winter and gaze at many flower magazines, seed catalogues or the internet in search of great plants. Of course, a pretty significant amount of time is spent in the office evaluating our bedding plants for the upcoming season. There are so many plants available to place in our beds that I begin to get a bit of brain freeze trying to determine what we might want to do this season. 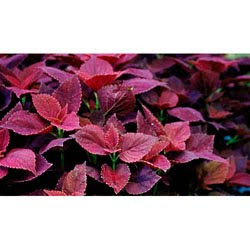 There are some plants which perform very consistently year in and year out which we continue to order. This season, about 50% of our plants are either different species or are a different color than last season. I've just sent off our order to Hummert International who brokers our order, locates the growers who can get the material we requested at the dates we would like it delivered. Hopefully, all of the plants we requested will be available. The plant material is grown from seed and or cuttings which take root and then are grown in cell packs for shipping. These plants can take from 4 weeks to 10 weeks before they have grown enough for shipping. Growers will make a certain number of plants a year based on past projections or estimates for the upcoming season. They grow plants based on when they would need to be sent to areas of the country so the finish growers like us have enough time to get them ready for the season. In our case, we are not as rushed to get our material grown because we do not begin to place it in the ground until after the first of May. 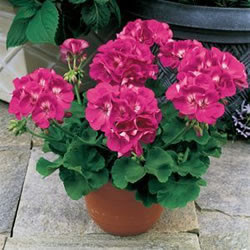 As you are aware, garden centers in the St. Louis area begin to set there material out in early to mid-April. We plan to bring our material in between March 17th and the April 1st which will allow us to get our more than 5700 plants potted and in the greenhouse. Our material will be grown this season at a more consistent temperature which will keep it more healthy and should grow at a more consistent rate. 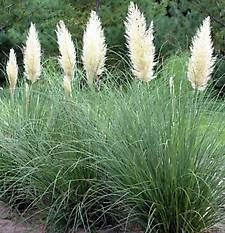 We will be growing our plants in slightly larger pots and will be doing more pinching of the plant material which forces it to brach to the side and makes the plant bushier. Below are just a few of the different plants we are bringing in this season. 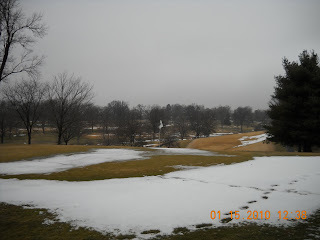 As we go through some winter thawing, I wanted to update those of you who are anxious to get back out onto the golf course with some pictures to show you the current status of the golf course. We have had some nice melting of the snow over the last few days but still have 6-8 greens with some level of snow still on them. To compound our issues, the greens are completely frozen with just a very thin layer on top beginning to thaw. With the greens being frozen, there is no where for the moisture to go but remain on or just below the surface or slowly roll off of the green. As the temperatures continue to stay moderate, thawing will continue but is slowed when there is no sunshine to help warm the surface of the green. 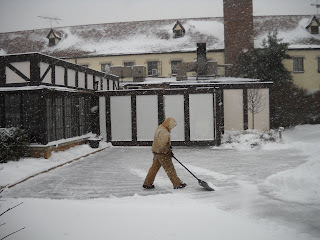 Rain does help to thaw the turf a little quicker and has a tendency to make the surface a bit more firm. Right now, all of our turf areas are very sloppy and unplayable; tees, fairway, rough and greens. I expect that the course will not be opening this weekend Jan 16-17 and will stay closed through the next week until our greens begin to drain the water away from the surface. We will monitor the conditions on a daily basis and will keep the pro shop informed when we might potentially open. 4th fairway and the front part of the green with snow. 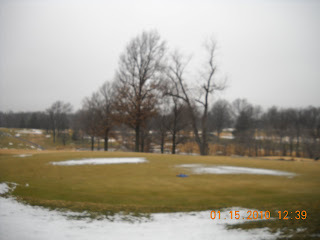 The 3rd green with snow cover and in the foreground you can see the water sitting on the green surface with no where for it to go except to drain off of the front of the green. 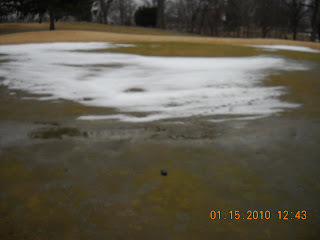 11 green with snow and water on at least 1/3 to 1/2 of the green surface. Here you can see water coming up around my boot as I push down on the surface. Where the greens are thawing, they are like a sponge completely filled with water. 10 green complex with more snow and ice on its surface. I have posted a section of Ty McCllellan's USGA regional agronomist report below which discusses thawing and frozen conditions of greens. The second article is from Ohio State University discussing the different turf conditions we face throughout the winter season and the impacts that winter play has on our greens. Oftentimes, golfers think winter is vacation time for the golf course maintenance staff, and they fail to realize the number of jobs on the golf course that are carried out through the winter. We are all familiar with the more common tree pruning and drainage work, but there are other key items to consider. Opening the golf course for winter play is one of the more difficult decisions a golf course superintendent or owner will make. Many golf courses just close for the winter while others remain open. In these situations, there is little worry since the decision has already been made. However, if you are caught somewhere in the middle, winter play decisions are difficult and often times result in political consequences. 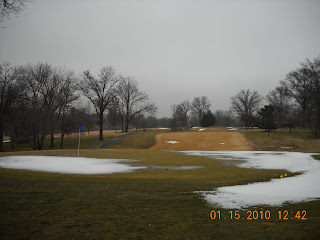 Whether to allow play or not are often late winter/early spring decisions. However, with the relative mild winter this year these winter play decisions are being made now. 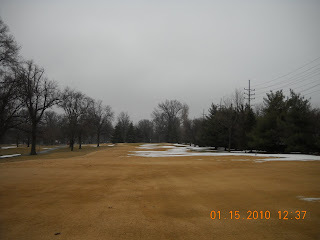 In general winter play is not good for turf, especially golf greens because of little if any turfgrass growth. The repercussion from no growth is little if any recovery from traffic or wear (especially on greens). Also, divots, ball marks and generally tearing up the turf become potential"beachheads" for the development of winter weeds like annual bluegrass (Poa annua). I have ranked the various situations from least to worst for winter play. I would say that any play on frozen turf (leaf blades, plants) should be avoided. Immediate damage will occur to the plant similar to playing on a frosted turf. In addition, golf greens will be subject to the most intensive traffic so use temporary greens where possible. 1) Play on dry unfrozen soil - Although wear injury is always a potential problem this is situation will result in the least damage. 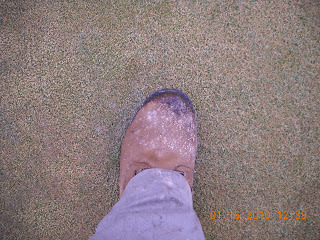 2)Play on frozen soil - Most likely will result in wear injury to the turf but little soil compaction. This condition is not occurring. Some thawing at the surface layer is occurring. 3)Play on wet, unfrozen soil - The potential damage under his scenario is significant soil compaction can occur but less wear injury. 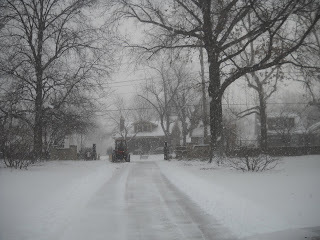 The problems associated with winter play will affect spring play. Once the spring season begins the condition of the course (hard, worn, etc.) will not be at the level of golfer expectation. 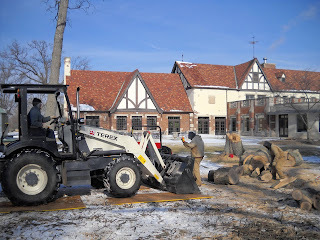 A little warmer weather has allowed the staff to get back outside this week and continue with our work. As our trees age, they become hollow and cracked. 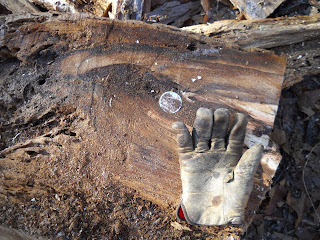 Sometimes, the tree has a large wound on the outside of the tree which makes it apparent that there is some type of serious injury on the inside of the tree. We had a large oak near the patio/wedding area near the club which showed a wound that was three to four feet high at the base. There were also large cracks that extended into the tree but we could not see how far into the tree that these cracks traveled. The tree was also snapping and popping during higher wind events. 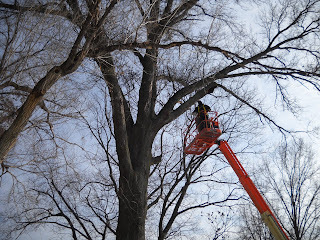 We removed this tree and the pictures below demonstrate that it was weak and severely compromised. 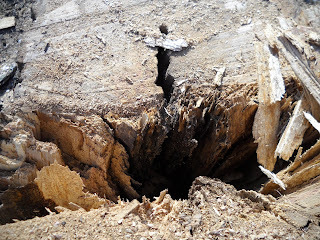 Inside third(heartwood) of the tree was decayed and you can see the large cracks radiating toward the outside of the tree. Large crack which went from the middle to the outside of the tree. The chipper is brought out into the field where we grind up the smaller limbs and the remaining material is hauled back to the shop area. We utilize this chipped material in some of our ornamental bed plantings that can handle this type of material. As you can see, this tree was in very close proximity to where many members and guests spend time in the patio area of the club. The logs are put in the loader and hauled back to the shop to be split for firewood. Russ, Jason and Tom are doing the work in the picture below. We have rented a lift for a month to assist us with removing the tops of some of the larger trees that are on our removal list. Some of the trees to be removed are too large to drop at once. It is not safe to the staff on the ground if the tree has a large amount of limbs on the top half and there are trees nearby which can prevent the tree from falling straight to the ground. We also want to protect the nearby trees, fencing and power sources from trees that need to be removed. We also plan to clean out some of our dead limbs on various trees throughout the proper. Dead limbs can create a hazard to our members and staff, create extra work for the staff when they fall during wind events and can encourage disease and or insect entry points in decaying wood. Skip and Mike working in the large oak tree on #7 which is dying and is being removed. The guys were cutting up a large log from a dead oak tree behind the tennis courts between holes 17 and 18 and came upon an interesting find. A ball was embedded in the hollow section of the tree. I'm not sure if one of our little gray squirrels hid it away for future use or some one's errant shot might of made an actual hole in one. Nothing like dry powder if we were in the mountains. Nice, light, fluffy snow which was pretty easy to clear. 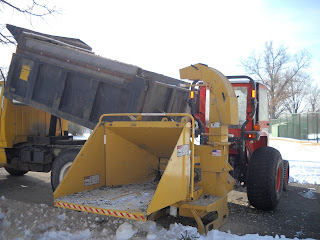 We will spread some ice melt to help clear the rest of the road and lot. Even though we are in our closed club period, we have a private function here this evening so we have to get things cleaned up. Is it just me or is the media creating a hysteria every time they get the opportunity to mention the word snow. One-half an inch or 8 inches, the area seems to go on lock down. I saw video last night where they were actually showing the milk section and bread section at a local grocery store instead of just talking about it. Asst. Skip clearing the front gate area. Assistant Mike clearing the edges of the pro shop walk. 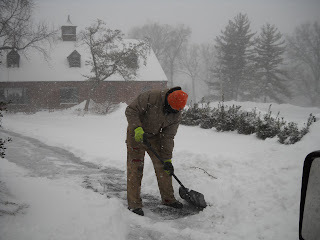 Jason clearing side walks and kitchen entrance.